A newly published study from the Dana-Farber Cancer Institute reveals that vitamin D can protect some people with colorectal cancer by perking up the immune system’s vigilance against tumor cells. The research, published by the journal Gut, represents the first time that a link between vitamin D and the immune response to cancer has been shown in a large human population. The finding adds to a growing body of research showing that vitamin D — known as the “sunshine vitamin” because it is produced by the body in response to sunlight exposure — plays a key role in cancer prevention. Ogino and his colleagues theorized that if the two phenomena were connected, then people with high levels of vitamin D would be less likely to develop colorectal tumors permeated with large numbers of immune-system cells. Colorectal tumors that do develop in these individuals would, by the same logic, be more resistant to the immune response. To determine if this was in fact the case, the research team drew on data from 170,000 participants in the Nurses’ Health Study and Health Professionals Follow-Up Study, two long-term health-tracking research projects. Within this population, the scientists compared carefully selected groups of 318 colorectal cancer patients and 624 cancer-free individuals. All 942 of them had blood samples drawn in the 1990s, before any developed cancer. 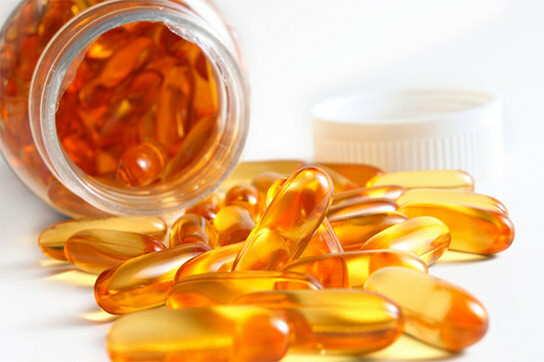 The investigators tested these samples for 25-hydroxyvitamin D — abbreviated 25(OH)D — a substance produced in the liver from vitamin D.
They found that patients with high amounts of 25(OH)D indeed had a lower-than-average risk of developing colorectal tumors that were enriched with immune-system cells. Funding for the study was provided by the National Institutes of Health, the Friends of Dana-Farber, the Bennett Family Foundation, the Entertainment Industry Foundation, and the Paula and Russell Agrusa Fund for Colorectal Cancer Research. 1 Comment on "Study Shows Vitamin D Protects Against Colorectal Cancer"
It makes perfect senses and its to bad. It seems to me that food the more food is processed the more vitamins are removed. I was looking at ice cream just last night and it doesn’t even make sense to me how it had 0% vitamins.